Large trucks and buses serve an important purpose, transporting goods and people to points across the country. Though large commercial trucks can weigh up to 80,000 pounds when fully loaded, they're expected to safely share the road with smaller and much lighter weight passenger vehicles. 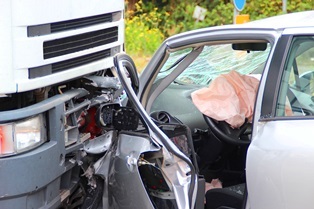 Unfortunately, collisions between large commercial trucks and passenger vehicles are all too common, and when they occur, the resulting injuries and other losses can be downright catastrophic. Read on to learn more about common truck crash causes and associated injuries, and how to seek compensation for damages sustained in an accident caused by truck driver or trucking company negligence. While truck accidents can be caused by motorist error—such as driving in a truck's “no zone” blind spots—they're often the result of commercial driver negligence or the company that employs them. Unsafe driving behaviors. Examples include driving while distracted, fatigued, and drunk or drugged, as well as aggressive road behavior. Untreated and/or unreported health issues. According to statistics from the Federal Motor Carrier Safety Administration, which regulates interstate trucking in the United States, nearly 30 percent of commercial vehicle operators have sleep apnea—a sleep-related disorder that can affect driving performance. Improperly-loaded cargo. When a truck's cargo exceeds the maximum allowed weight limit or is loaded improperly, it can shift en route and potentially cause the driver to lose control. Inadequate hiring practices. Trucking companies in a rush to add to their workforces may fail to screen prospective hires to ensure they have commercial drivers' licenses and clean driving records. Insufficient training or supervision. Just as some trucking companies may fail to properly screen new hires, they may also neglect to provide adequate job or safety training, ensure drivers are complying with state and federal regulations, or administer drug tests in response to questionable behavior or after an accident. Unrealistic schedules. Trucking companies may set unrealistic schedules for their drivers—or offer incentives for completing assignments in an unsafe amount of time. However, doing so may violate federal trucking regulations. Depending on the truck accident circumstances, both the trucker and his employer may share in liability for injuries and other losses. When large trucks and buses collide with smaller vehicles, passengers of those vehicles suffer the brunt of injuries, damages, and fatalities. Truck accident victims fortunate enough to survive these crashes may be left with serious or disabling injuries. The knowledgeable truck accident attorneys with Rechtman & Spevak can assist you in seeking a financial award for crash-related medical expenses, property damages, lost wages, loss of earning capacity, pain and suffering, mental anguish, decreased quality of life, loss of enjoyment of life, and other damages. Act quickly, as waiting too long to file a lawsuit can have disastrous consequences. The Georgia's statute of limitation laws mandate how long you have to file a claim. Contact us today to schedule a free initial consultation to discuss your case with a member of our skilled legal team.